I’m starting to put together another of my Making it Yours posts, this time around a chair. 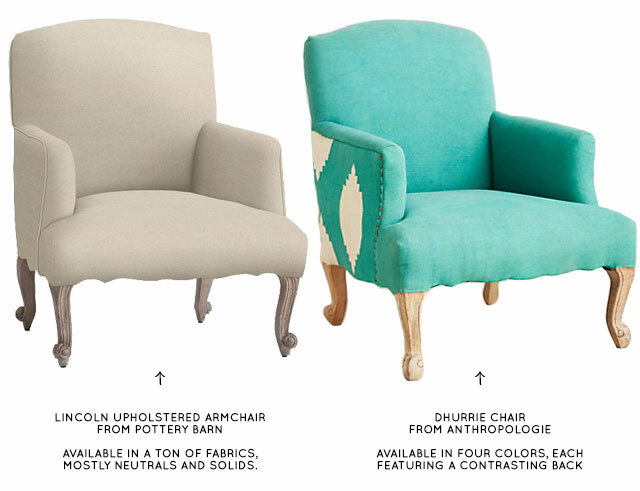 I’ve been looking at so many recently that I realized the Lincoln Upholstered Armchair from Pottery Barn is nearly identical to the Dhurrie Chair from Anthropologie. Depending on fabric, they’re roughly the same price, too. 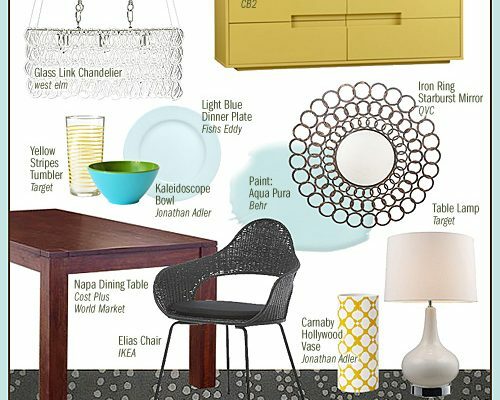 So which is more helpful/interesting to see featured for a few different room designs? I’m inclined to go with the Anthro version, because I figure it’s harder to envision multiple ways of incorporating a crazy pattern than it is a neutral fabric, but which would you prefer to see? Your choice depends on the room. The beige linen is more versatile and can easily be punched up with a colourful pillow with the rest of the tones in your room. The question is, the green anthropologie chair the right green? I’ll play devil’s advocate for you and say that sometimes starting with such a blank slate like the PB chair can be mind-numbing! There is such a thing as too many options. Are you seriously asking for readers to vote on which chair you use to creat a hypothetical mood board for no specific person or home? No one really cares Nicole. Choose either chair…I always skip your mood board posts anyway. You just lost a reader with this one. I’m sorry that you don’t enjoy them, but I love working on my Making it Yours series and I figure if I’m going to devote several upcoming posts to it, I would like to choose the option that’s most helpful. The question is posed in relation to these two chairs, but essentially what I’m wondering is if people have a harder time decorating around a blank slate or a statement piece. I care, Nicole! I love this series, and I’d like to see how you make the printed chair work! 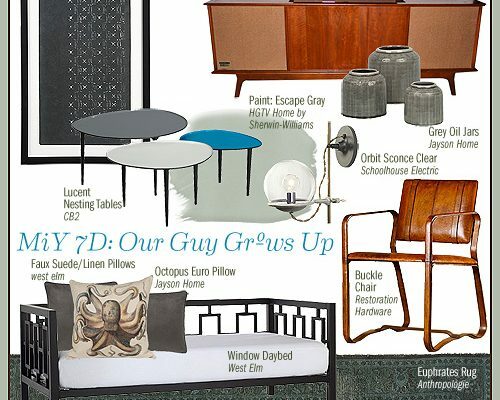 I’ve always wanted to get a fun printed accent chair but worry that over time I’d tire of it or be stuck in a certain look, so it would be great to get some ideas on how a more unique chair can transition over time. And Loriann, there’s enough negativity in the world without you adding to it. If you don’t like it and will stop reading her blog, do it! Just don’t bring Nicole and her other readers down with you. I like the posts, if you don’t, then move on. No reason to be a child about it. Never ceases to amaze me. Anyway, I’d like to see if you could use both chairs interchangably in the room you build. That would be awesome! That way both the nuetral person and the teal-lover could benefit! Interesting challenge. I have never read a comment so rude in my life. No one really cares what blog posts interest you, there are other blogs to entertain you and if you think you can do better publish your own. The Making it Lovely Community is better off with people like you. Wow, I am floored by how rude this is. Go find another blog. My thought process was the same as yours– I’d love to see a wild pattern in multiple settings. Perhaps you’ll encourage readers to take a risk in their own decor instead of playing it safe. To my above commenter… harsh much? Loriann, If you haven’t anything kind or otherwise helpful to add it might be best to simply refrain from commenting. It undermines the community and only serves to upset and/or stress a woman who is heavily pregnant. It smacks of bullying. Less is more. In any case, AU REVOIR! I was just thinking yesterday how much I miss the Make it Yours post. I even love the imaginary characters! To each his or her own. I have 2 pairs of similar chairs in my home. Our tan ones have made the rounds so, I’d would love to see how my new peacock blue chairs could be used. Keep up the great work & hang in there for the home stretch of your pregnancy. I say use the statement piece. for the past five years, i lived in an apartment with white carpet and all white walls–i accumulated several crazy pattern pieces to help break up the space…and now in a house where i have full rein of walls, floors, and otherwise, i’m struggling to make the fun pieces fit in without looking too crazytown with my desire to PAINT ALL THE WALLS! and COVER ALL THE FLOORS! tl;dr: i vote for the anthro chair for purely selfish reasons. please and thank you! Give me aqua/teal or give me death! I’d be more interested in seeing a series on the Anthro chair, too. I feel like a statement piece can be more difficult to decorate around, especially when it has a trendy feature like the Ikat-ish print on the back. Loriann is a little harsh here, but I have to agree with her. This blog has been on the downward spiral for sometime, and honestly at this point I think Nicole should do a separate series for BOTH chairs while we wait in the interim for a real DIY post. Durrie is Australian slang for a cigarette. I think you should go with the hypothetical durrie chair for the name alone. But the swirly bits on the other hypothetical chair are far more interesting. I’d love to see a post on the Anthro chair! My instinct with more patterned pieces is to go neutral in the rest of the room, but I’m hoping there’s a way to have more than just one statement/interesting/unique piece (because I always love the wackier pieces best) without the whole space looking crazy. Maybe you can help? Love your blog! 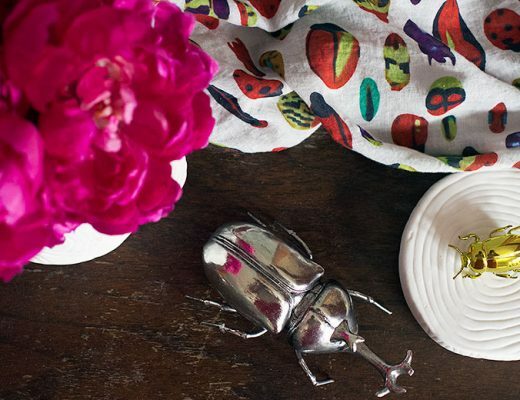 Statement pieces are things you fall in love with…you wonder what to do with it and how to make it work with what you have. If you can’t picture it, you walk away from the purchase. Not practical, you think. Doesn’t fit, you sigh. How cool to see Nicole put together the process for making a fun piece work! I’m amazed at what you do *while* heavily pregnant, *while* remodeling your home, *while* raising small children. DIY can wait *awhile*. Wow. I have formed a belief that the rude Internet commenters are like the mean kids at school, all grown up (well in adult bodies anyway). If they were 12 they’d be the cyber bullies that cowardly bully their classmates, while Hiding behind a computer screen. I wonder if they’d be so mean in person or if they’re fake in person. Feel free to delete. I just had to vent. People forget that there are real people behind the websites, or maybe they’re just jerks. I agree that the tone of Loriann’s post was harsh, but I disagree that all comments on websites or blogs have to be positive. And one harsh comment doesn’t mean that Loriann is being a bully. As a blogger, I think you have to be open to all of the positive and complimentary comments, but you also have to be open to comments who may not like your work. I say this as someone that doesn’t mind these types of posts and who enjoys reading this blog. I’m just tired of the back-and-forth on blogs when someone leaves a negative comment, or when a blogger like Jenny Komenda of Little Green Notebook takes the ridiculous stance that commenters should only leave “nice comments.” I think Nicole’s response to Loriann’s was great, by the way (I’ve seen a couple of blogger responses that were downright mean or ridiculous like Jenny’s). Keep up the great work, Nicole! Oh, I certainly don’t think all comments need to be positive , not at all what I said. But there are civilized ways to comment and be constructive, if that was the intent. When people are rude, it’s simply not constructive. I would also summise the intent was to be mean, not give constructive advice. There is a difference. Just wanted to second the praise for Nicole’s response. It’s nice to see a mature adult who can handle rude comments with class. I’d love to see you use either the teal or the multi colored Anthro chair. Although they’re kind of pricey they’re really cool and I’d love to see how you create a room a statement chair like this. Teal please! I want to see what you can do with it. I’d love to see different color schemes. Nicole…I challenge you to create rooms that could work with both chairs. Can it be done? I’d be interested to see a room where you could interchange a more traditional chair and the punchier version and have both work and create different moods. But if I HAD to pick one, I’d go with the anthro chair. Though I am kind of dhurried out, I say the statement chair is the one I would want to buy, but wouldn’t know how to evolve. I would like to see both. While both chairs are completely out of my budget, I do like seeing how you put things together. I like to think that if I have some good inspiration pieces, I can find a thrifty way to implement it. I really enjoy the Making It Yours posts — as someone who has moved a lot, and had to style the same furniture for new space/new uses, I recognize my own challenges in them! They also provide a useful way of thinking about furniture: what will stand the test of time? What will grow with me? I’d be interested in seeing what you do with either piece, but more interested in the green chair. I love colorful furniture and rooms, but struggle to put them together. I vote for the anthro chair. More fun! Definitely Licoln!!! Its just sooo pretty!!!! I like the fact that you are showing us that both chairs are nearly identical, I would not have noticed. I like this series. I have a crazy pattern chair that now I no longer know how to integrate, so I vote for the Anthro. The “Make it Yours” series and mood boards are some of my favorite posts. Personally I’d like to see the Lincoln, but I’ll enjoy them either way. Keep up the great work, Nicole! Since my big pieces of furniture (like chairs and couches) are on the more neutral side, I would prefer to see how you can create an interesting room around the pottery barn version. Thanks! I really like this series – ignore the haters! (Who *are* entitled to their opinions but certainly could find MUCH more constructive ways to share them). And my vote is for the Anthro chair! Such a fun colour – can’t wait to see how you style it all up! Whaaaat? I love the Making it Yours series (it’s my very favorite feature. on pretty much any blog.) and I adore the ad hurried chair, so please pick that! I would love to see how you decorate around the plainer chair. Because I am on a limited budget, I tend to invest in neutral furniture with classic lines. I would love to see how you would create different decorating “styles” around one basic chair, especially if you could incorporate some budget friendly pieces that could be easily switched out. Thanks for asking! I’d love to see the Anthro chair, it’s much more challenging. I think it’s fun that you asked. The statement chair would be oh so helpful!